A Tomb for Boris Davidovich / land art / sculpture / 2009 Land art work is an allusion to the famous novel by Danilo Kis 'A Tomb for Boris Davidovich' – it shows a grave in the shape of a bed which is made from natural materials (stone, wood, soil). 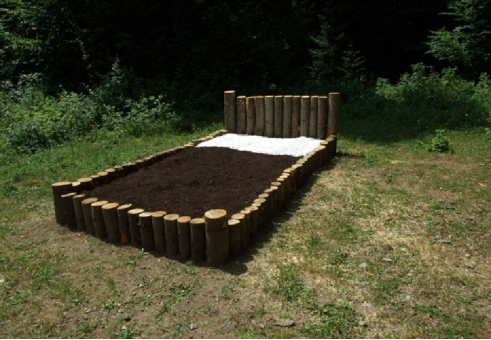 This bed simulates a tomb by having the space where the body lies filled with soil whereas the headboard is filled with gravel. People who survived the holocaust, mass persecutions and terrors by any ideological or totalitarian regimes such as fascism, Stalinism, Khmer Rouge movement, apartheid etc. can, in a way, 'hardly' wait to lie down, fall asleep and to 'rest' from omnipotent civilisational evil... This is a bed for all of them.